Will Paras Be Laid Off? ...a question came in from a para and I put out the call for answers. Below are the responses: so far. If you have something to add leave a comment or email me and I'll put it in the comment section. Nothing has been mentioned about Para lay-offs at any of the meetings I've attended. It seems that they are focused more so on teachers. As a chapter leader I did receive a district seniority list last year, but I'm not sure if there was one for this school year. No mention of paras - it is all about teachers and school aides right now. The UFT is "carefully"reviewing seniority lists. They will send to Chapter Leaders when they are sure everything is correct. Seems DOE sent Principals lists that were way, way off! However, when I had paras in my school they had a list also. She/he can call the UFT District Rep and get this information. While it's impossible to know for sure what's going to happen, the best guess is that Bloomberg and Co. won't go for para layoffs, because so many of the para positions in the DOE are IEP-mandated. there is a district wide list. it is given out once a year, usually it is compiled as of january / february. it is given out about now. when i was chapter leader, the district rep would give out the list at the monthly meeting. however, some principals have been known to try an end run around the list. so it is up to the para to be vigilant. bi-lingual and special talents paras can and do skip the seniority list legally. exempt unless federal mandates for their services would protect them. i certainly would tell the para to call the district rep and uft's para office at 52 broadway for clarification. This absolutely glorious Sunday morning has been nearly ruined for me by a UFT post I just read that the charter school legislation passed by Albany this week addresses "most of the UFT's key concerns." What Mulgrew seems to be happy about is this: "We changed the conversation about charter schools." Changing the conversation, though, isn't what I thought we've been paying for the union to do. A couple of things. First, no matter what the law says we all know they will violate it and beat it to death. Parent input? GIVE ME A BREAK! What this means is another hundred non-unionized charters. The union will tell you they are going to organize teachers at these charters. Sure an inept union for its current members will attract teachers from charters who will find that the UFT can't protect them any more from evil employers that they can current UFT members. But they will be very adept at collecting dues. What these hundred schools mean is that they will take kids from public schools which will mean increasing layoffs over time. And when the quota is filled they will come back for another lifting of the cap. No more non-profits? Watch them morph into something that can make a profit. By the way, Eva is a non-profit. $370,000 a year for running 4 schools, multiplied by 40 when she gets her wish. Call it what you want- maybe personal profit- which there is plenty of room for. As a former employee, I can honestly say that I cannot BELIEVE (no pun intended) that there is not enough oversight from the Chancellor to expose the atrocities that are happening on an almost hourly basis at all there of these schools. Principals/”Superintendents” are fired and escorted out of the building midday, months after being publicly hailed and showered with praise by the CEO Melendez. There have been three different principals in the last two years, and the recklessness and haphazard manner with which decisions are being made about how many is spent, and who assumes positions of leadership make it seem as if ideas were drunkenly drawn from a baseball cap. There are people in that building making six-figure salaries who have not made a single contribution to the students or organization at large in their three years. What a great way to make a quarter of a million dollars! The majority of leadership positions are held by people in with less than one, or even zero teaching experience which has led to a major disconnect between themselves, the rest of the staff, and the kids. Don’t trash all charter schools…trash this one and all the others like it. Stop giving 5 years extensions to places like this and then walking away for long periods of time only to do one day “state visits” which consist of student and staff file checks and cursory classroom observation which are hardly enough to unveil the corruption that exist just below those surfaces. Boy, do I have emails from Eddie Melendez over the last 6 months - nasty, gangster-like stuff - after he tried to harass Susan Ohanian, one of the top educators in this country. Eddie is a classic POS (Piece of Sh-- for those not familiar with the term). Semi-literate ramblings. Read all the comments about the Believe horror story at the NY Times CityRoom blog. Defeat for Weingarten in DC? And Pittsburgh Too? We've been chronicling the various stages of revolt by teachers in many urban centers over the sellout policies of the AFT/UFT. For those new to this blog, we team the AFT and UFT up because the massive numbers of members in NYC-based UFT controls the 650 thousand member NY State United Teachers which dominates the 1.6 million member AFT – a classic tail wagging the dog story. There is no separating the AFT/UFT though many teachers in NYC unfortunately thought that Michael Mulgrew would be in some way different that Randi Weingarten, only to find out since his 91% victory in the recent election that his difference is more style over substance. 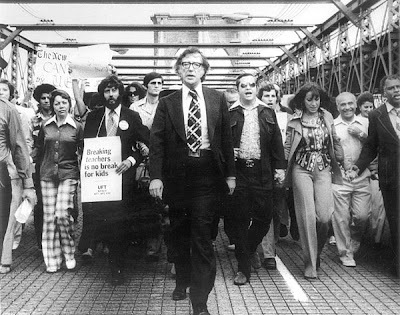 Did anyone think that when Shanker gave up leading the UFT in 1985 to Sandy Feldman that Shanker wasn't still in charge. We've seen teacher unrest in AFT bastions Washington DC, Chicago, San Francisco, Seattle, Detroit, and throughout the state of Florida and NEA dominated cities like Los Angeles and Oakland. Now, I've been saying all along the autocratic AFT, which has had 3 former UFT leaders, all hand-picked by their predecessors (they do that in monarchies) running it since 1974, will do everything in its power to damp down this movement, including manipulating elections (see Washington DC and Detroit and Chicago if they can. For instance see: Why AFT President Weingarten stole my elected union job! from a Washington teacher. Here is some good news from our buddy Candi Peterson and maybe a glimmer into where things stand in DC Saunders/Peterson Slate For WTU Elections Committee Wins Overwhelmingly ! Some of us have maintained that when threatened, the AFT/UFT would use every means, legal and illegal, to hold onto power. That's the way dictatorships operate. (See AFT Hack Attack on Portland Local 5017, Randi Goes to Portland As AFT Threatens ...). A great example occurred back in 1985 when NAC (a predecessor to New Action) won an officer position for VPHS - as a matter of fact it was NA leader Michael Shulman who defeated George Altomare by less than a hundred votes. The Unity controlled Ex Bd refused to certify the results and wouldn't seat Shulman claiming the very election they had run had irregularities. Unity controlled the election committee. Chutzpa in spades. NAC was forced to submit to an arbitrator who ruled a new election which didn't take place until Jan. 1986, leaving the high school VP seat vacant for 6 momths. Shulman won this time with about 60% of the vote as the high school teachers revolted against Unity. Unity then did everything it could to undermine Shulman over the remaining 18 months of his term. The AdCom even held secret meetings without Shulman. In 1991 NAC barely lost the high schools and junior high school officer positions but did win 13 HS and MS Exec Bd seats, the high water mark for the opposition. Feeling the threat, in 1994 Unity pushed through a constitutional change taking away the right of high school teachers to elect their own VP (elem and middle schools too) by making them at-large (so everyone in the union including retirees vote for VPs) so the opposition would never again win an officer position. It was pushed through the DA at a meeting held on day there was a snow storm and never went to a general vote of the membership. The fallout from an election of four new executive board members of the Pittsburgh Federation of Teachers this week highlights what some teachers say is a growing schism between the union's leadership and its 2,700 members. Their election to the board marks the first time that challengers defeated incumbent officers in a union election in at least 30 years. The four who won the seats -- teachers at Pittsburgh Carrick High School - - contend their victory in Monday's election shows how dissatisfied their ranks are with union leaders. The group won four of the 16 positions open on the 32-member board. Two days after their victory, however, the teachers said they were shocked to receive a note from union President John Tarka notifying them that Mr. Moss and Mr. McManus will not assume their positions as staff members at union headquarters on the South Side on July 1, the start of their four-year terms. Instead, they said, Mr. Tarka told them that Mr. Moss and Mr. McManus will remain in their teaching positions at Carrick, while Mr. Gensure and Ms. Wilson -- whom they defeated-- would keep their jobs as union staff members at district headquarters. Read full story at Norms Notes. Yes, in NYC all this is a long, long way from happening again, but if it ever did - watch out. In the meantime, some of us may head to Seattle for the AFT convention to find out why this city is different from all the others. A flashmob infiltrates the Westin St. Francis hotel in San Francisco and performs an adaptation of Lady Gaga's song "Bad Romance." The event was organized to draw attention to a boycott called by the workers of the hotel who are fighting to win a fair contract and affordable healthcare. Lesbian Gay Bisexual Transgender Queer activists put the song and dance together as a creative way to tell the hundreds of thousands of LGBTQ people from all over the country coming to San Francsico in June for Pride to stay out of the boycotted hotels. WSJ, now also owned by Rupert Murdoch, gives Perkins’ opponent more publicity; while revealing that the pro-charter parent organization called Parent Power Now is funded by DFER, the hedge fund group. More disinformation and subterfuge, of course, like the pro-Craig Johnson flyers financed by DFER, that don’t even mention charter schools. Basil Smikle Jr. has a lot of ideas about how to address Harlem's most vexing problems, from crime to housing to underemployment, but his biggest asset as he runs for state Senate against Bill Perkins may be that he supports charter schools. 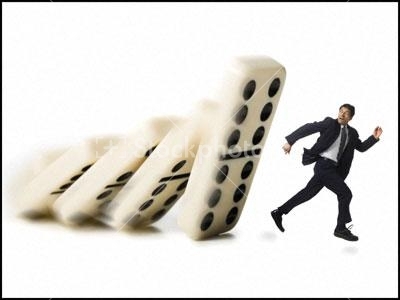 The dominoes keep falling as the UFT keeps appeasing and retreating. 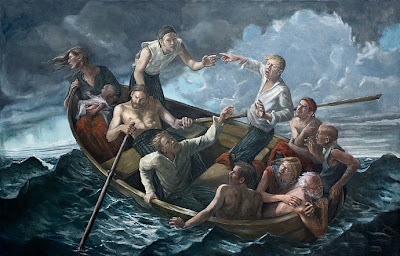 We said that once the election was over the cataclysm would come and that the bigger the pro-Mulgrew vote, the worse it would be (how are things looking, New Action?). Rubber rooms, teacher evaluatio n systems based on test scores, the charter school cap - which will mean 460 mostly non-union schools. There are 1500+ schools so that comes to 1/8 of the system. But we know when they will ask for another doubling when all these slots are filled we eventually get to 400 in NYC and then my numbers below work. Remember, Eva Moskowitz wants 40 schools so she can earn - let's see now, 370,000 for 4 schools - hmmmm, turning into a nice piece of change. Watch public schools get drained of students and teachers. Coming layoffs in public schools will not only be due to a budget crisis. Imagine the staggering numbers. Chicago lost over 6000 teachers out of about 34,000 due to charter schools. Are we looking at a loss of 12-15,000 teachers here in NYC? What would seniority mean then when 400 charter schools are filled with first and second year teachers while public school teachers with goodness knows how many years go looking for jobs? And by the way, as we know from history, the hits will not stop until the ed deformers get the entire arm: next they are coming for seniority and tenure protections. Do you think the NY State legislature will withstand those attacks, especially with pro-charter anti-teacher Cuomo as governor? I know it looks bleak, but out of the ashes a real teacher movement can rise, allied with parents and students. Over the last year some very tentative alliances have been being built - fragile seeds that need nurturing or they could be stamped out at any moment. If you are one of those teachers who say, "Why should a union be worried about building alliances with students and parents, but should focus only on our needs?" - you better wake up. Until true community based alliances are built that are capable of putting up resistance that can battle the billions lined up against us, the ed deformers will get their way. And then there is Chicago where if CORE wins the union election on June 11, the ball game begins anew. LOS ANGELES—The Los Angeles teachers union is refusing to sign the state's application for a federal school reform grant. United Teachers Los Angeles president A.J. Duffy said Friday that the grant might require the state to follow policies that would cost more in the long run than the one-time grants. The federal government is offering up to $700 million to states that propose specific and aggressive plans to improve schools. Los Angeles Unified Superintendent Ramon Cortines says the Race to the Top grant would help pay for reforms that the district is already pursuing, like revamping teacher evaluations, using data to improve instruction and turning around struggling schools. Duffy says the federal money requires teacher evaluations to be tied to standardized test scores and the union believes that's not effective. Questions have been flying about layoffs and in what order. In 1975 we suffered massive layoffs. People were so upset it was the first time that Albert Shanker lost control of the union - briefly. There was such a demand from the members, even the district reps, who were elected by chapter leaders at the time but were still all Unity Caucus, were for drastic action. The pressure from below forced Shanker to call a strike and we were out for a week. He went to jail and looked like a big hero but we were dubious over whether he would sell us out - the opposition was sure he would. Later, Randi Weingarten used to say that Shanker told her that strike was his biggest mistake. I was part of a group called the Coalition of NYC School Workers at the time (some of the same people who helped found ICE in 2004.) We were out in force along with other groups in the opposition calling for the UFT not to give in to 15,000 cuts, a cut of an hour and a half in the school day and the loss of two preps amongst other things which I can't remember. My fairly small elementary school alone had 13 people excessed - down to people who started teaching in 1968. A massive membership meeting filled Madison Square Garden where we handed out thousands of leaflets urging them to vote down the agreement. To no avail, especially with the focus of the cuts being on elementary schools, the least militant division of the union. [The next year in 1976, the secondary schools got chopped in the classic case of divide and conquer. Naturally, this is not the official union position, so here a link to a recent piece they did. In 1975, when the last round of massive layoffs took place, the districts were the ones that bore the brunt of the process. After excessing was done in each school the district started placing teachers in other schools in the district based on seniority. The remaining teachers were then placed in the citywide excessing pool to be placed in other districts if they had sufficient seniority to bump. One of the ironies of the process was that in districts where people didn't want to leave like District 31 on Staten Island people who were to be excessed out of the district voluntarily took layoffs instead of bumping to another district so that they could protect their right of return to the original district (once people were hired back - in some license areas that took many, many years) which they would have lost by accepting placement elsewhere. The records in those days weren't even computerized they were on index cards at the BOE - the inaccuracies took many years and I am sure many legal battles to eventually straighten out. What will happen now with Bloomberg looking to destroy what little is left of seniority - who knows what they will do? Ira mentions those index cards. I heard this story at one of my fraternity reunions. One of my frat brothers who also taught in District 14, Williamsburg (many of us ended up there because a whole bunch of the frat bros grew up in the 'burg) was plugged into the local UFT dominated political machine that controlled the district (and boy are there stories). Through that machine he got a mid-level job at Central HQ at 110 Livingston St. When the layoff calls were to begin there was panic at 110 Livingston St. because those index cards were dumped all over the place. There was such disorder, figuring out a rational way to lay off and recall people seemed Herculean. On a Friday, he put out a call to the District 14 crew that he needed them for the entire weekend and most everyone in the D. 14 machine turned up to work sorting the cards. At least a hundred people I believe. Some stayed the entire weekend, sleeping over. By that Monday, the cards had been arranged in the proper order and layoff and recall lists were prepared. he was declared a hero and began a rise that led to his becoming the chief of personnel at the DOE for many years - right up through Klein, who didn't seem to like his wheeler/dealer style. He left to go to Miami with Rudy Crew. Bring signs and noisemakers, and wear Bronx Science gold and green! The United Federation of Teacher's Chapter at the Bronx High School of Science invites you to join us for a picket of Mayor Bloomberg. We are appealing to Mr. Bloomberg for relief from administrative harassment at our school. Two years ago, twenty math teachers at our school filed a complaint against the harrassment and abuse at the hands of their supervisor. Their claim has been upheld by a neutral arbitrator in a recent fact-finding decision, but the schools chancellor Joel Klein has outrageously decided to ignore the fact-finder's report and take no action. The Department of Education's disregard of the fact-finding decision will only lead to increasing tension at the school, further demoralization of teachers, and a worsening learning environment for our children. We have no choice but to take our case to the Mr. Klein's boss, Mr. Bloomberg. Please join us to show solidarity in the face of harassment of newer teachers, veteran educators, and union activists. The DOE and the national media would like to have the public believe that teachers are only disciplined in order to improve educational outcomes, but this fact-finder's report exposes that good teachers have fallen victim to supervisors who abused their power. Ed Note: For more on Bronx High School of Science search this blog. What else do you expect? One thing I know, State Senator Malcolm Smith's scandalous Peninsula Prep charter, along with all his other scandals, has smoked him out and into social service work. Vying for the Nobel Peace Prize, he is personally going around pulling up the pants of gang bangers. Gee, do you see all those expensive ads running attacking the teachers union for calling for some greater oversight over charters? They smack of the kind of desperate spending of people who fear they will be stopped from making a lot of money if they don't get the cap lifted. Mayor Duffy wants to be Bloomie and be a dictator over the schools, with lots of parents and teachers fighting him tooth and nail. But now he can be Cuomo's boy Friday as Lt. Governor. And we know what happened with the last Lt. Governor. With so many governors vaporizing and Cuomo's arrogance, practice saying, "Governor Duffy." Are ELL Students Underrepresented in NYC Charter Schools? Sol suggests why not try to save $35 million and apply it to reducing layoffs? Because at Tweed it's all about market-based ideology, not education. Diane Ravitch says, "It might better be called the Race to Nowhere, or as some have dubbed it, the Race to the Trough or the Dash to the Cash." Another sweetheart deal to get teachers judged based on student test scores made by the UFT to make life wonderful for teachers. The UFT claims a great victory. "They wanted to judge by 50%. We cut it to 40%." Wowy. One NYC teacher blogger said: A sad day for education; 40% of teacher evaluations are now tied to test scores; Welcome to all test prep all the time; The new normal for public education; Public education will look like the Gulf of Mexico when they got done with it. Did you read Steve Brill's hatchet job on teachers in the Sunday Times, a wholly owned subsidiary of BloomKlein, Ltd? AFT President Randi Weingarten, the great enabler, is crying about something Brill said she said she says she didn't say. Who cares? Yep, makes sense in Bloomtown. Bloomberg's rubber stamp PEP passed it last week with only 3 votes against, including our own Queens rep Dmytro Fedkowskyj. Way to go, Dmytro! The UFT leadership cried about the lack of democracy on the PEP, which ignores what the public has to say. Come to a few UFT delegate assemblies and executive board meetings to see the model for ignoring what people have to say. When Arne Duncan asked Diane Ravitch, "What are we going to do about Detroit?" she responded with, "Give it to KIPP [the charter school chain.] He laughed. Hey, it's Detroit. You can't give it away. Finally, the NY Times has jumped into the fray. The NY State Ed Department is the monitor for charter schools. Ho, ho, ho. Merry Christmas. Some parents have been chronicling the corrupt NY State Department of Education and its ugly parent the NY State Board of Regents too, headed by Bloomberg friend and neighbor Meryl Tisch, who also has Joel Klein over for Passover to ask the 4 questions, one of which is always: Why is this reorganization different from all the other reorganizations that came before it? UFT Pres Michael Mulgrew loves Meryl and spent a good chunk of time at the last Delegate Assembly singing her praises because she "knows education," which makes sense since she spent 10 minutes teaching pre-k at an exclusive Hebrew school about a hundred years ago. Recruitment Poster for Charter School: Hey Kid, Wanna Make a Hundred Bucks? A photo of a poster on a 3rd floor wall at a charter based at IS 126 in Williamsburg/Greenpoint was being passed around by parents and community groups as outrage grows. 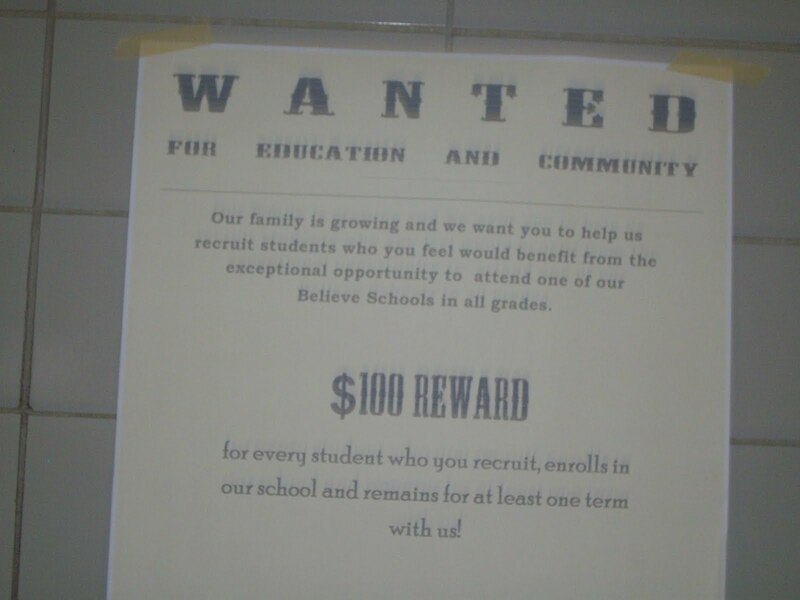 The Believe charter group is offering a $100 bounty to any student who can recruit someone for the school who will stay for one term. Can you BELIEVE this? 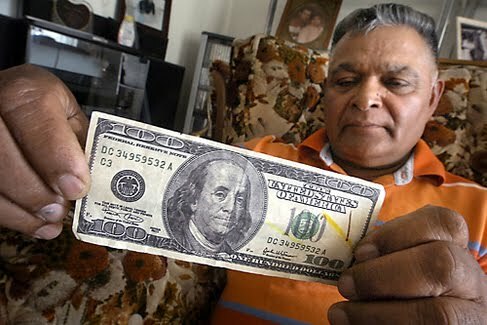 They make the poor kid who recruits some sucker wait an entire semester before collecting his 100 bucks. They must have electronic force fields keeping them in. (I know more than a few parents who have been there, done that and left.) What happened to all those waiting lists to get into charters that they are so desperate they have to bribe kids with a hundred bucks to get recruits? For a hundred bucks I'll enroll there myself. Given the schlep from Rockaway, I try to schedule multiple events when I go into the city. Yesterday (Wednesday) turned out to be a busy day indeed. First up was a meeting with a reporter from a major paper. I love it when reporters ask the right questions and are willing to probe. It could be phony but there seemed to be genuine enthusiasm as I told tales of the ATR wine and cheese rally (reporter wanted to see my videos) and other stories. Not that I expect any article from the press to reflect the depth of the discussion (we very rarely get to see what lies underneath in these articles), but at least I got a sense that the reporter "gets it." I figured it would take about 15 minutes for boredom to set in but we did 45 minutes and I was asked to meet again. If an article appears I'll talk more about it. Then it was off to Bar Pitti to meet old UFT war horses Merry Tucker and Bruce Markens. Bruce has always been a hero to people in the opposition because he was the only non-Unity district rep who consistently stood up to his Unity hack bosses – for over a decade. Of course that was the days when district reps were elected (by the chapter leaders in the district, mostly Unity anyway, but at least a semblance of democracy). Randi finally pulled the plug on DR elections in 2002 - and Bruce's consistently getting elected through the 90's as Manhattan HS DR was a major reason. Full disclosure: I had announced my candidacy for DR in my District in the spring of 2002. In my interview with Tom Pappas, Bob Astrowsky and Michelle Bodden I said I wouldn't retire - that caused almost as big a laugh as when I pulled out copies of Ed Notes as an example of my work as a union activist. The guy they chose used to brag how he pulled Ed Notes out of mailboxes. He's still there. Ask teachers in the District if they feel represented. Actually, in the long run, having a DR responsible to the leadership instead of the members works against the leaders, but that's a story for another time. You can imagine that the DR story gave the reporter quite a kick. But back to lunch. Delightful. Merry (who used to schlep around the Bronx with me distributing Ed Notes) and Bruce have done some travelling and it is always fun to catch up. After lunch, Merry was off to see her mom, a well-known activist who was married to Steve Zelluck). Barbara Zelluck, who I don't know, is seriously ill. We wish her well. I am forever thankful to Merry for introducing me to Lisa North and Gloria Brandman, amazing ICE and GEM activists. Bruce and I walked uptown to CUNY where the GEM meeting was taking place talking union politics. (We are major wonks.) He has so many great stories and so much knowledge and history, I keep bugging him to do a debriefing on camera to leave a record of Unity perfidy. I went up to the air conditioned GEM meeting (what a great crew) which was very vigorous with lots of great reports from schools and news of the picnic at Prospect Park this Saturday to make posters for the schoolwide informational pickets on June 4. We also had some good discussions, especially on the new teacher evaluation system. Tilden Chapter Leader John Lawhead gave a mesmerizing analysis of the agreement, which I thankfully taped and will put it up in a day or two. Wonderful stuff. We also had a good and heated discussion as to whether we work to get the UFT to act or give up on them. I'm in the latter group and pushed my Vichy analogy, but there are other points of view, which we will explore in some forums on the UFT, maybe this summer. UPDATED: Recruitment Poster for Charter School: Hey Kid, Wanna Make a Hundred Bucks? Jenny Medina picked up this story after I sent her the photo after I read her very good piece on charter school scams and the need for more scrutiny that appeared Wednesday. She published an excellent piece on the Wanted Poster at the NY Times City Room blog, also yesterday. See below for her story (and she gave Ed Notes a good pop). For background, I have lots of contacts who sent me the picture and story as I worked my whole career in District 14 and spent my last years in the system doing tech support work at a number of schools, IS 126 included. That is the school where you may recall the same charter invaded the school library and the teacher made a you tube about it that got some notoriety. See Dismantling the IS 126 Library. Rumors are that the teacher was put in the rubber room as punishment. Sources are saying that as a result of our exposure and the Medina story (followed up by the Post and News) the DOE may be looking to punish the people (grilling the gang at 126?) who revealed the story while ignoring the school's attempt to bribe the kids. Also see Caroline Granan comment about similar stuff at KIPP in San Francisco. When I visited KIPP San Francisco Bay Academy, there were posters plastered all over the school offering prizes (Gap and Old Navy gift cards) to get new families to apply. I think someone is being naive to think that’s novel. And that’s at KIPP, where (all chorus together) “all KIPP schools have long waiting lists,” according to Paul Tough in your very own newspaper. Ahhh. Those waiting lists. I hear that just about anyone who wants into a charter who meets the smell test (no ELL, Special ed, parent signs pledge to give pint of blood every day, etc) can get in. And some charter school teaching buddies are telling me that getting and keeping good teachers is getting tougher and tougher and they're even trying to lure teachers away from each other. Wait 'till the cap is lifted. It will be the wild west. But demand even in a down economic market may drive some salaries higher. However, I get loads of teachers looking for jobs contacting me and all of them are desperate to get into a public school and look at charters as a last resort. Yes, the young do think of pensions and health care and the stability of seniority protections that a public school teaching career can bring- at least until the UFT sells that out too. By the way, over the past few months I and Susan Ohanian have received some "lovely" notes from this particular charter school operator (and buddies), some of which I will share with you real soon. This photo of a poster on a 3rd floor wall at a charter based at IS 126 in Williamsburg/Greenpoint was being passed around by parents and community groups as outrage grows. What happened to all those waiting lists to get into charters that they are so desperate they have to bribe kids with a hundred bucks to get recruits? For a hundred bucks I'll enroll there myself. A sign in a charter high school offers one way to build up enrollment. We know about schemes to pay students for high marks. And we’ve written about some of the marketing tactics schools are using to attract families. But one charter high school in Williamsburg is taking a step further – offering a $100 reward to any student who recruits another teenager to attend the school. Last night we were sent a photo purporting to show a sign posted on the third floor of Public School 126 at 424 Leonard Street, which houses the Williamsburg Charter High School as well as its two spinoffs, Believe Northside Charter High School and Believe Southside Charter High School. Jacqui Lipson, a spokeswoman for the schools, declined to comment but did not deny that the sign was up. Charter school advocates typically boast about how far demand outpaces supply for seats in charter schools. Just last month, the New York City Charter School Center announced that more than 55,000 students had applied for 11,000 seats in charter schools. Ms. Lipson also declined to say how many students applied to each of the three schools this year, directing the question to the city’s Education Department. We’ve asked and will post the answer as soon as we receive it. From the CORE blog. How delicious right in the belly of the ed deform beast. Huberman is Duncan's replacement. Thousands rally against the school budget cuts. Huberman, Daley, and the CPS are in for a fight when 30,000 members are united. In a display of unity that is uncommon in an election season, all five caucuses of the CTU came together to march against Huberman’s threats of ballooning class sizes to 35 and major cuts to educational programs. Koco, Teachers for Social Justice, Pilsen Alliance, Blocks Together, and other GEM partners organized students, parents, and community members to march in unity with the Union teachers who are integral members of their communities. CORE Presidential candidate Karen Lewis talking to young people at rally. One police officer on duty estimated 5,000 protesters, making this one of the largest educational protests in decades. Initially, CORE planned to organize the rally with their GEM partners, but realized that this was an event that would be bigger than a caucus, and made a resolution at the May House of Delegates meeting for the event to be a Union event; a show of unity against Huberman and Daley. Although it was a political risk to organize members to an all-caucus event while on the campaign trail, CORE made it a priority to build this event, and it paid off. This is exactly the kind of Unionism that CORE wants and the membership deserves. Tuesday May 25, 2010 will go down in history as the beginning of a new way. We had thousands of people in the streets telling Huberman “No” to 35 in a class, “NO” to cuts in programs and “NO” to balancing their budgets on the backs of educators and students. What made this possible was that members of all five caucuses came together to show unity. I would like to thank all the members of PACT, CSDU and SEA for running campaigns that focused on the pressing issues we all face. We appreciate the expressions of support we have received from the leadership and membership of those caucuses. It is an honor to be among people who care passionately about the direction this Union must take. More Scrutiny for Charter Schools in Debate Over Expansion. Dee Alpert certainly seems to know where the bodies are buried at the corrupt NY State Department of Education and the ugly parent the NY State Board of Regents too, headed by Bloomberg friend and neighbor Meryl Tisch, who also has Joel over for Passover to ask the 4 questions, one of which is always: Why is this reorganization different from all the other reorganizations that came before it? Examination of the agendas and committee materials for the Board of Regents shows why Tisch is crazed, reportedly, to get RttT money, no matter what it takes to do so. NYSED's budget has been seriously cut by the Governor - to the point that it's merging offices and divisions to save money and avoid vacancies it can't fill due to retirements, etc. Several months ago one major office reported that due to budget constraints already in place at that time, it appeared NYSED wouldn't be able to do the minimal level of monitoring work the feds required in order to maintain eligibility for large federal grant programs. The proposed budget makes the staff cuts far worse. It's getting to the point where NYSED might have to fire its legendary patronage and no-show employees and officials and just keep people on staff who actually did cognizable work. This is, of course, a fate worse than death to an agency which exists at the whim of the NYS Legislature, a/k/a Sheldon Silver. There was even talk of cutting down on its incredibly extensive program of farming out work to consortia of colleges, universities, BOCES and public school districts instead of doing the work with in-house staff, thus decreasing its reknowned "schmear factor" exponentially. It's also famous for using outside consultants - very pricey ones - far more than necessary - ergo the $1,000 per day early childhood consultant it included in its RttT Round One application. I'd love to know who that consultant is - I assume it's someone who's very ... well-connected. Rest easy. NYSED has discontinued its practice of putting the staffing of its Audit Office on its web site. We can safely assume that, as always, it has made a policy decision to cut auditors ... first and foremost ... and leave NY school operations to the tender mercies of their collective officialdom. As far as RttT money being constrained in terms of what it can be used for - relax! USDOE found that NYSED totally mishandled its Reading First grant and gave money to districts which shouldn't have gotten these funds according to NYSED's own RF grant proposal. Then the NYC Comptroller found that the NYCDOE wasted at least 10% of its RF grant on an "unusable" RF web site; paid teachers who were mostly unqualified to be RF staff, and couldn't account properly for at least 50% of its RF funds which didn't go toward paying staff salaries. What did USDOE do about this appalling state of affairs? Nothing at all, of course. What should it have done? Required NYSED (and specifically the NYCDOE) return a fat chunk of their RF grants to USDOE for redistribution to states and districts which would use them properly. USDOE OIG audits and NYS Single Audits have reported consistently that NYSED doesn't actually audit or verify what districts do with their federal grant funds. So relax! No matter what NYSED puts in its RttT grant application, and no matter what USDOE approves in that application, NYSED is going to tell districts that they can use RttT monies any darn way they want, and if all they want is to use it to stop teacher layoffs, then that's what NYSED will let them do. Of course, they'll have to lie and misreport re what they've done with the money, but NYSED won't audit or verify, nor will it instruct districts' outside auditors to do so. We'll find out that RttT funds were misspent when a new batch of USDOE OIG audits are issued, probably around 2014. As usual, the NYCDOE misrepresents and, where that doesn't suffice, flat out lies. The NYSED web site shows that the NYCDOE itself is quite late in submitting its outside audits. It also reported several months ago that the "big" outside audit of the NYCDOE's largest federally funded programs had significant negative findings. Under federal law and regulations, when any district - NYCDOE, charter school - gets negative outside audit findings, NYSED has the responsibility for insuring that negative audit findings are corrected satisfactorily. The last USDOE OIG audit of NYSED's functioning in this area reported - as did prior reports spanning decades - that NYSED does absolutely nothing to insure that where outside audits disclose fiscal and/or programmatic irregularities, these are corrected. Nothing. In fact, the USDOE OIG found that federal funds which NYSED distributes to districts (school districts and charters alike) are very much at risk of "fraud, waste and misappropriation." When the NYS Comptroller does a different kind of audit on public school districts and BOCES, only NYSED has the legal authority to insure that appropriate steps are taken to correct negative audit findings. Comptroller follow up audits this past year have uniformly shown that NYSED, in fact, has not insured that corrections were made and important negative findings from prior full audits were repeated. This isn't a "robust" system. It's a dead one - as dead for public school districts as it is for charter schools. The audit issue re charters is far more complex and nuanced than anyone involved in the tiff wants to fess up to publicly. They're all playing with your heads and praying that you don't figure out what the real issue is re charter audits v. public school district audits, which has absolutely nothing to do with what's bruted about. What Are You Doing May 29th and June 4th? GET INVOLVED IN THE BATTLE FOR PUBLIC EDUCATION. COME TO THE GEM MEETING: Weds. May 26th, CUNY, 4:30 - 34th st and 5th ave. Bring id. I hear a whole lot of griping going on. Over BloomKlein or the lack of action by the UFT. Or what action they do take is more PR than real. As the rise of CORE in Chicago shows, it is possible to start taking action at the grassroots level. So even if it is only you, join this growing movement on June 4th by holding an informational picket. This is not the usual UFT one shot deal, but part of a building process within the school communities. June 4th is going to be a day of protests at many schools around the city against the budget cuts and layoffs. Some school are picketing before or after school that day. Others are giving out buttons and stickers to faculty, staff and families to wear in protest of the cuts and proposed layoffs. There will be informational fliers to give out too. to join NYCoRE in Prospect Park on May 29, 1-5 pm to make signs, snack, play and meet great people! Come all day, for a couple hours or just stop by. Bring your friends, families and students! We need lots of signs for the upcoming protests. We will be near the 11th and 15th street entrances to the park off of Prospect Park West. stop on the F, R and G trains. Here is a map of where we will be. Let us know so we can plan material amounts. Attached are fliers in English and Spanish. personalize it for your own school. Is the UFT About to Blink on Lifting Charter School Cap? The odds of reaching an agreement to lift the cap on charter schools improved markedly after negotiators made "major progress" in resolving two controversial issues, a source close to the talks said yesterday. City, state and union negotiators have discussed creating an advisory council that would assess the impact of sharing space with traditional public schools. But the task force would not have the power to block a charter school from moving into a building. City, state and union negotiators have discussed creating an advisory council that would assess the impact of sharing space with traditional public schools. But the task force would not have the power to block a charter school from moving into a building. Duhhh! That's the ticket, another advisory committee. Leonie Haimson asks: "How many impotent advisory councils do we already have, whose “advice” the administration totally ignores? 32 CECs and the CCHS. How many more do we need? Zero." There are three such firms that operate about 10 percent of charter schools in the state. The teachers union has called for a ban on for-profit firms running the publicly funded, but privately managed, charter schools. One idea floated would cap the number of schools run by for-profit firms [my emphasis]. That's another ticket. Cap 'em, double entendre intended. For the time being. We know how the ed deformers work. Get the charter cap lifted by agreeing to limit for profits and then just go and do what they want anyway. By the way, the way around this is to count each block of schools as one. Thus Victory greedy blood suckers could have 10 schools but count them all as one. Watch a battle emerge to get this wrinkle in once they get their pound of flesh. Where: A bar called 49 Grove, at the corner of Bleecker Street. Leonie had some further comments on her listserve. Isn't it great to have parent activists stand up for the right things while our own union lays down and dies? By now, you probably have been seeing lots of ads on TV and flooding the internet from Education Reform Now, a group which is pushing to raise the charter cap in NY State and to eliminate seniority protections for teachers. On its website, ERN claims to be a "coalition of parents, teachers and education advocates" but is really a bunch of deep-pocketed hedge-fund operators. Indeed, they can only be used for a very narrow set of policies, including teacher evaluation and merit pay based on test scores, more data gathering, etc. – few of which would actually improve the quality of our children’s education. And what are the so called “common sense education reforms”? The charter school lobby is spending millions to try to persuade the Legislature to radically expand the number of charters, while insisting that the State Comptroller be barred from auditing charter schools' use of public funds, preventing parents from having a say in their co-locations in public school buildings, and insisting that profit-making operations continue to be able to make a buck off our kids. I urge you not to fall for their pro-privatization propaganda. Already, the city plans to spend $545 million next year on charters, more than the $493 million in cuts planned from our public school budgets. We simply cannot afford to lose any more money from the classroom. Given how our schools are bleeding, the proposal to expand spending on charters is outrageous. The Assembly will be considering raising the charter cap this week. Call your Assemblymember today, and ask him or her to restore full funding to the education budget, and not to raise the charter cap unless there are rigorous protections for taxpayer and parent rights; including for the CECs to have the authority to approve all co-locations. Find your state legislators at http://nymap.elections.state.ny.us/nysboe/; for the Assembly, the toll free no. is 1-877-255-9417 and press 3. Of course, we all want to keep great teachers; and the best way to do so is to fight against the threatened budget cuts to our schools. But by undermining seniority protections, this group is out to further undermine public education by weakening the professional status of the teaching profession; so that our schools are confronted with a revolving door of inexperienced (read: cheaper) teachers. The reality is that there are only two objective, quantifiable factors that research has clearly linked to more effective teaching; teacher experience and smaller classes. I'm receiving emails that the invasion of UFT officials to spin the teacher evaluation agreement (under the guise of talking about the budget cuts) is beginning. I know the drill. They will come and talk and talk and talk, maybe leaving 5 or less minutes for questions. Don't let them get away with it. Prepare the people in your school by handing out a list of questions based on some of the issues raised below. Ask them why delegates, the exec bd and the membership no longer get to vote on contract modifications. Make 'em sweat for their money. 1. NEGATIVE: It’s a foot in the door for using Standardized Tests and Merit Pay. 2. NEGATIVE: The new system claims to eliminate what the UFT describes as a totally subjective system. Yet, seven of the eight criteria are the same. The UFT says the addition of an eighth criterion (test scores) changes everything. Can’t we find less subjective criteria other than standardized test scores? It’s gonna count for 40%! The UFT says it “limits the influence of state tests on teacher performance evaluations”, it actually INTRODUCES state tests into teacher performance evaluation. Anything less than 100% is a “limit”. 3. NEGATIVE: Since there’s still much that has to be “negotiated” the agreement will only lose some of what appeal it does have. For example, 40 of the eval will be test scores% for starters. 4. NEGATIVE: There are no specifics about how peer review would work, how test scores will be used. 5. NEGATIVE: The contract is NOT enforced now regarding Art. 8, so why should we assume the UFT will enforce what is in our best interests regarding this agreement? For example, if the UFT doesn’t want a “gotcha” system, why doesn’t it challenge the informal observations put in our files and used to U rate us? Read Teaching for the 21st Century… You’d never know it was meant to apply to our members. It was supposed to eliminate the “gotcha” observation. 6. NEGATIVE: Lead Teacher wannabes will compete with their colleagues, not cooperate. After all, it’s who ranks at the top that will get the lead teacher gig. 7. POSITIVE: is that if negations fail the old system remains in place, as would be expected with a contract. 8. POSITIVE: Growth model assessment seems to be the best model if you have to go with standardized testing. 9. POSITIVE: Teacher improvement plan looks like it will be specific and transparent. Again, depending upon what is negotiated. These negotiations need to take place in full view of the membership in order to invite member feedback. Secret negotiations are only meant to keep the membership in the dark . BOTTOM LINE: Teaching to the test will take on a new urgency. Gone will be creative pedagogy. Close the Teacher Centers, they’ll be a waste of money. We will all be in the test prep business. NEGATIVE: What about people like Guidance Counsellors? Are they going to rate them on how well the kids keep their appointments? That's about a useful as any of these other criteria in difficult learning environments. After year one, all teachers in all grades will be subject to these value-added assessments; implying that there will have to be new state tests as well as new local tests in all subjects and all grades. I would expect that all these new tests, as well as teacher time (or State time) scoring them, in every grade and subject, will cost far more than the $700 million that is the maximum amount that NY State could get from RTTT.
. The regulations adopted pursuant to this section shall be developed in consultation with an advisory committee consisting of representatives of teachers, principals, superintendents of schools, school boards, school district and board of cooperative educational services officials and other interested parties. Once again, parents are omitted from being mentioned among the key stakeholder groups to have any voice in this system. After all, it’s only our kids. Wonder if charter schools will be subject to the same regime. The Times article does not say whether the test score component will be based upon one year or several years value-added. One year’s increases or decreases in test scores are statistically meaningless at the school level; as shown by the volatility of the NYC school grading system; and they are even more unreliable at the classroom level. All of which explains why the National Academy of Sciences has said emphatically that basing teacher evaluations on value-added test scores is not ready for prime time. What is clear from the NY Times article is that NYC public school students will be subjected to yet an additional set of “local tests”; which will mean millions of dollars to develop these new tests, millions of student hours spent taking them, and millions of teacher hours in scoring them. In addition, I predict that the DOE will want to give these new local tests both at the beginning of the school year and the end, to sharpen up their “value-added” per teacher component. And most likely, more NY teachers will even more try to flee from classrooms and schools with high-needs students, the exact opposite of what the federal government, state and city say they are trying to achieve. What if they had a union and nobody joined? Obama Admin Connected to Anti-Teacher Union Ads? UNTIL WE GET A VOTE, SAY NO TO COPE!